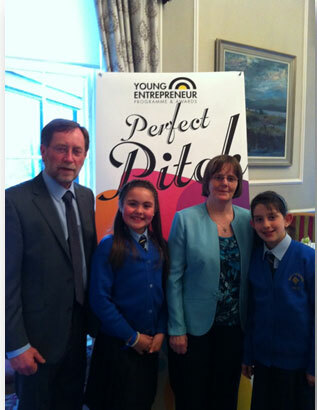 The Junior Entrepreneur Programme (JEP) is an entrepreneurial education programme for primary school pupils. It was founded in County Kerry in 2010 by Jerry Kennelly of Tweak.com, The Institute of Technology Tralee, Mary Immaculate College of Education in Limerick and Shannon Development with the aim of fostering an entrepreneurial culture among primary school children.This programme helps the participating pupils to develop a number of skills including presentation, literacy, writing, drawing, technology, research skills, numeracy, consumer awareness, storytelling, listening skills, creative thinking, problem solving, collaborative skills and team work. Ms. O Callaghan has organised the programme in our school over the past two years with great success. We have seen some wonderful projects developed during this time, our own understanding of entrepreneurship education in the Primary Curriculum has been enhanced, links between the home, school and the local community have been developed and the process has instilled confidence and self-esteem in the pupils.